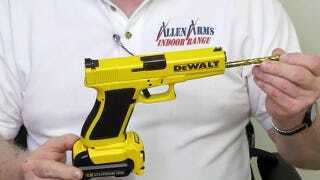 The gun enthusiasts at Allen Arms Indoor Range in Greenville, South Carolina, decided to combine their love of all hole-making tools by modding this Glock Model 21 to look like a DeWalt cordless drill. But sadly, even though there's a bit protruding from the front, the drill doesn't actually work. Although, that of course doesn't stop this creation from easily making holes wherever you need one.